NICK’S Window Cleaning has a variety of plans for all of our customers, whether you are looking for service for you home or business. When you contact us about window cleaning in Scarborough, we will work with you to customize a plan to suit your needs, budget and expectations. Rather than try and fit you into a prepackaged deal, we work together to get a plan that’s custom-made to your needs. We provide a combination of excellent service and professional work, all while making sure what we do can fit into your lifestyle and budget. Be sure to contact us today for a free estimate. Believe it or not, there are big differences between the companies that offer window cleaning in Scarborough. Picking the right one can be difficult. Window cleaning is in our name for a reason: we believe that great service starts with a dedicated team. We take the time and effort to ensure that all of our staff are professional, courteous, and amazing at their jobs. 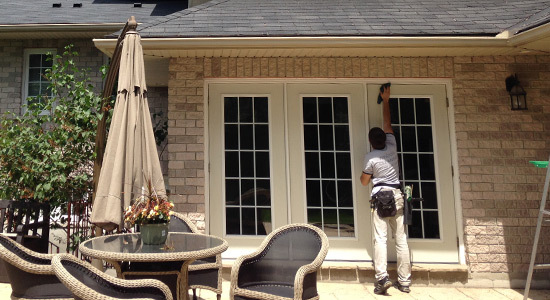 So whether you have a regular window cleaner that you’ll get to know over the years, or just having someone help you clean up before a big event, you can trust our professional Toronto window cleaning team to make your windows look great. Cleaning windows can be tricky, delicate, and complicated work that requires a large range of tools to do effectively. We ensure that all of our window cleaning staff are fully trained and equipped to use the latest in window cleaning technology. The right equipment not only makes the job that much quicker, but provides an extra crystal clear clean that you’ll notice the moment we’re finished. Whether it’s commercial or residential service you can depend on the professionals from NICK’S Window Cleaning to deliver the highest quality Scarborough window washing service. While many window cleaning companies will try to avoid bonding and insurance to save money, NICK’S Window Cleaning take the safety and security of our staff and clients very seriously. All of our workers and staff are fully insured and bonded. It not only helps keep them safe and protected, but ensures that our clients are as well, which is important for everyone on the job, whether they’re window cleaners, customers, or you. NICK’S Window Cleaning offers service six days a week during almost any time of day, which means you can get the window cleaning services you need, when you need them. So if Monday mornings work best for your schedule, that’s when they’ll be there. If you’d prefer the window cleaning done on the weekends, we can do that as well. Rather than make a schedule that you have to work around, our versatile plans mean that we can give you the services you need at the times that are most convenient for you. We provide full interior and exterior window cleaning services for both residential and commercial properties within the Scarborough area. NICK’S Window Cleaning is fully insured and staffed by professional, personable, highly-trained workers that provide a high-level of service to each and every customer. With full interior and exterior window cleaning your windows look their best, sparkling clean and letting in all the natural sunlight possible. Our mission is to make happy, satisfied customers and in doing so build strong lasting relationships – contact us today to discover what makes us the first-choice amongst window cleaning companies in Scarborough. There is no comparison between a professional window cleaning and a home window cleaning. No matter what cleaner you use it won’t be able to match the commercial grade cleaners that are available to professional window cleaners. You also don’t have the right equipment to safely and quickly clean windows that are large, or windows that are on upper stories. Many window cleaners don’t just clean the windows they also use a clear sealant that will protect the windows after they have been cleaned. That will make your windows sparkle until the next time they are cleaned because it will help repel dirt, sand, dust, pollen and other debris. Safety is a real concern when it comes to cleaning windows. Tens of thousands of people are injured every year trying to clean their windows and doing other home improvement projects. That’s because most homeowners don’t have the right equipment or the expertise to safely get up on huge ladders and clean windows. Professional who have commercial grade equipment and years of experience using that equipment can clean windows safely no matter how high up they are. Unless you are in great health and have commercial grade equipment and cleaners trying to clean the windows yourself could be very dangerous. It’s much safer and easier to hire professional window cleaners to get the windows on your home clean and shining. Experienced window cleaners work fast. They can have your home looking great in a matter of hours usually. It would take a homeowner twice the time or longer to get any results. Even then the results wouldn’t be as good as the results that a professional window cleaner can get. If you want your home to look great again and you want your windows cleaned quickly hire a professional window cleaning crew.